At the grocery store or the farmers market you may have noticed the beautiful green bunches of kale. Kale grows well in the cooler season and is full of great benefits and often referred to as ” a nutritional powerhouse” or the “queen of greens.” Some of the benefits include high doses in iron, Vitamin K, Vitamin A, Vitamin C , calcium and it is delicious. Below is a tasty recipe you can add to your meals this fall season. Remove one large bunch of kale from stems. Peel and chop lots and lots of fresh garlic. Sautee garlic in coconut oil in a cast-iron frying pan for approximately 2 minutes over medium-high heat. 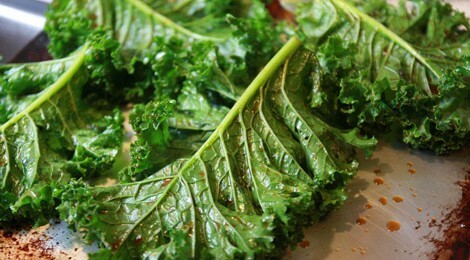 Add kale to pan, then add approximately 1/4 cup water, and salt and pepper to taste. Stir to combine, and continue to cook until the kale is just wilted. Remove from heat. This cooks very quickly, so be sure to have everything all ready to go before you begin.